Learn about the Irish folklore on Rainbow Fortunes at Vegas Spins! Created by IWG, it comes with a 5x5 grid on which several cells are displayed. Different symbols are hidden behind them. The game’s background consists of the colours of the rainbow, trees and a green landscape which reminds of Ireland. According to an Irish legend, a pot of gold is hidden at the end of the rainbow! Do you have what it takes to find it? The different symbols you can see during the game are the Diamond, Lucky Clover, Star, Horseshoe and Heart. Load the game up on any desktop and mobile device and join the fun! You can choose a ticket cost using the + and – buttons on the Ticket Cost display. After buying your ticket, pick 1 cell at a time with your cursor or press the Reveal All tab to reveal all of them in one click. Line up a minimum of 3 similar symbols horizontally, vertically or diagonally to trigger a payout. Bet Levels: Bet levels are not present on this game. Amount of Paylines Selection: No lines are available. Coin Values: Select one of the following ticket costs: $0.20, $0.50, $1, $2, $5 and $10. 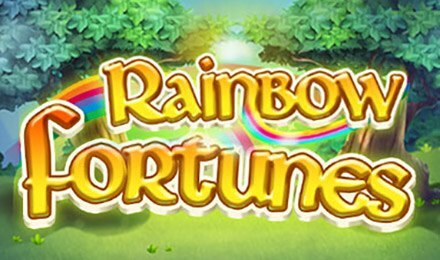 On Rainbow Fortunes, the 2 Bonus icons are the Wooden Plank and Pot of Gold. They help to trigger 2 different bonus features. When you reveal a Wooden Plank on the grid, you can enjoy the Lucky Barrel Bonus Feature by clicking on the Spin button. The wheel can land on a prize amount which is awarded. Continue spinning the wheel until it stops on “Collect”. The bonus game is then over. When 3 Pot of Gold icons are collected, the Pots O’ Gold Bonus Feature is activated on Rainbow Fortunes. During this game, tap one of the 3 Pots displayed to trigger the amount revealed, after which the bonus round ends. Have lots of fun while you launch Rainbow Fortunes at Vegas Spins where entertainment is guaranteed. Good luck!